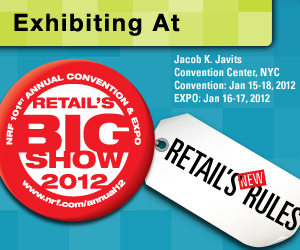 NRF 101st Annual Convention and EXPO is right around the corner. Next month, many of the world’s largest retailers and partners will converge on New York to share ideas, make connections and showcase the latest and greatest in retail technology. Of course, Irisys will be there highlighting our thermal checkout line management and people counting solutions. This year our booth is all about interactivity. We will have experts on hand to discuss how infrared and thermal solutions can improve customer service and boost sales. And for those looking for the full experience, we will have the technology in action. Visitors who stop by our booth will have an opportunity to see themselves as thermal images on screen, and can also post it to Facebook and Twitter. It’s military technology applied to retail – how cool is that? Plus, Mark Ryski – author of Conversion: The Last Great Retail Metric – is giving away signed copies of his book. Mark, founder and chief executive of Headcount Corporation, is a respected author and a known expert in traffic and conversion analytics. We invite everyone to stop by, get a signed copy of his book and discuss his passion for retail metrics. Mark is a wealth of knowledge, and his book is a must read for retailers. Visitors who stop by our booth (2921) can also register to win a $1000 Visa Gift Card.